Hello! Dr Chris Naunton here. I’m an Egyptologist, writer, broadcaster and public speaker. My book, Searching for the Lost Tombs of Egypt was published by Thames & Hudson in October 2018 and is available via Amazon or from your local bookshop. I do a bit of TV work (more here) and have several other projects on the go; with any luck most of them will eventually make their onto the ‘TV’ ‘Writing and Research’ and ‘Events’ pages here. I’m also Director of the Robert Anderson Research Charitable Trust (RARCT), a London-based charity that provides support to visiting academics, and President of the International Association of Egyptologists (IAE) – more on this sort of thing here. Chris just watched your special on TUT on PBS and you were fantastic and the story compelling. Thanks so much. Keep up the good work. Hi Naomi, I’m not sure you’re quite right! I get a lot of questions like this and am hoping to find time to write something to explain my thoughts but for now, I replied as follows to another similar question recently: The question of skin colour is certainly complex … The ancient Egyptians generally depicted themselves as having reddish-brown-coloured skin, and those of other cultures with different colour skins e.g. the Kushites a group of foreigners from the area to the south of Egypt in modern-day Sudan were depicted by the Egyptians as having had much darker brown skin. Ancient Egypt was certainly a multi-ethnic society, by the First Millennium BCE at the latest, but in any case ethnicity is not the only factor in determining skin colour. … There are numerous factors involved in making up any given individual’s cultural and ethnic identity and that this probably held true for the ancient Egyptians as now. So, I myself would usually be considered ‘White British’ according to the classifications most commonly in use here, but I would also consider myself to be a Londoner, English, European, Anglican Christian (by background and upbringing but a non-believer) with (probably) a bit of Celtic Scots and Irish in the mix, and probably a bit of Scandinavian going further back through my family history. Equally, Haremakhet, Chief Priest of Amun in Thebes in the early 7th Century BC was Kushite i.e. foreign by birth and probably had darker skin than your average Egyptian, but his name was Egyptian, he worshipped Egyptian gods, worked in an Egyptian temple, wrote his name in hieroglyphs and was buried according to Egyptian traditions close to the Valley of the Kings. I hope this helps! It is very nice to meet you. I am certainly no egyptologist but I do study ancient history extensively. All tough I do agree very much with Dr. Naunton, I also agree with you that there were some black Egyptians. A discovery further south has found a dynasty of Egyptians that ruled for a short time and they were believed to be of black descent. You sound very proud to be of black descent yourself and I greatly condone that! We should all be so proud of where we come from. I have however, brought up your question with some others and I believe it is of great importance to point out that if you truly believe all Egyptians are black, than you must also consider the fact that (as per the bible) those of black descent were also the first known Slave owners. I personally do not believe in any type of slavery, nor has it been in my family background. I am of similar descent as Dr. Naunton and I am very proud to have many siblings (in law) as well as nieces and nephews of black descent. I find this message important to say because I am Canadian and slavery is becoming a very hot topic here as people are forgetting that we were not part of the states and we helped give slaves a place of refuge along with a normal life, as possible as could be done. I think it important to know we must consider all areas of our ethnic background and have a proper understanding of it prior to fighting for it. What I mean by that is….by right fighting that all ancient Egyptians are black, you are also saying that those of black descent are also the first known slave owners. Please understand Naiomi, I mean no negative intent, I am speaking from a historical point of view. I apologize if any of what I had said has been interpreted as an insult as that is the furthest thing on my mind. Hi Chris 🙂 I’m a bit mad on ancient Egypt, particularly Tutankhamun. I recently saw a documentary (not one of yours) which proposed the theory that Tut’s tomb was used as a hiding place for a lot of Akhenaten’s treasures, purely to clear him out of Egypt after the changes he had made. 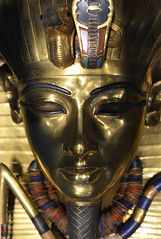 Including the idea that some of the artefacts had been amended to make it look like they were made for Tut. What do you think of this? Hi Beckie, it’s very clear now that many of the things in Tut’s tomb were originally made for others including Nefertiti and possibly others. There was a very concerted effort to expunge Akhenaten’s name from the records and the destruction / repurposing of his burial equipment seems to have been part of this. Whether re-use for Tut was part of this or not isn’t clear but the availability of material a hurry – Tut died unexpectedly it seems – was probably a part of it. I hope that helps! Chris N PS Further reading of you’re interested: Reeves, ‘Akhenaten’ and Dodson ‘Amarna Sunset’ both available inexpensively online! Hi Chris! Will you marry me? hi Beckie, I contributed to a film about Cleopatra also for Channel 5 which has yet to be aired but I’ve got no transmission date yet – I’ll be sure to post the info as soon as I get it! Hi Chris – I hope you’ve not already answered this question! Do you know when/if the possible hidden chambers behind King Tuts’ tumb, will be excavated? Also – are you aware of any upcoming “extensive” digs in the Valley of The Kings? Hi Chris !! My question is What did you study at university? I was thinking of going to study ancient history ( undergraduate degree) after my gap year but I’m a bit nervous because people are telling me that there is an extensive amount of reading involved and as someone who struggles with literacy I’m kind of second guessing myself. I love everything to do with history and would love to study it at uni but I don’t know if I’m throwing myself into the deep end. What advice would you have for someone interested in studying ancient history and would you recommend it? Thanks for the help I really appreciate it!!! Thank you very much Chris for replying!!! I really appreciate it!!!! And funny enough, I’m from Ireland but was looking at university’s in Birmingham as I will be relocating there in the summer!! I am a great admirer of your work. In the little spare time I have, I enjoy studying Egyptology and am hoping the complete the certificate in the future. Hello Chris, I have watch many programs that you have been envolved in I really enjoy Egyptian history I recently saw the secrets of egypts lost city was really interesting good job. Anyways my question is I saw another program suggesting that the bust of Nefertiti is a fake or that it might have not been found at the site it was said to be found at and that she didn’t even resemble the great beauty the busts portrays. I would like to know what are your thoughts on this subject? Hi Jocelyn, Being a mischievous sort, I like the idea that the Berlin bust of Nefertiti is a fake and I think this is worth thinking about. There is no piece quite like, and one of the reasons it’s so extraordinary is that the queen’s face has much a modern feel to it, which feels somewhat out of step with much of Egyptian sculpture particularly from this period. There certainly was something of a conspiracy around the discovery and the reasons it came to leave Egypt which would surely never have been allowed had the representatives of the Egyptian authorities really known what it was – anything of national significance was retained by the Egyptian Museum, Cairo at that time and this piece surely would have met that criterion. However, I understand recent analysis of the pigments on the surface of the bust suggest they are ancient which would seem to end the debate. It’s a very unusual piece but probably genuinely ancient! Yes there is a very modern look which led me to believe that possibly it could not be genuine. Fake or not its beautiful work. Has there been any other art besides this bust that capture Nefertiti likeness? I thought a lot of art or record of her were destroyed. Thanks for the reply. As queens go, Nefertiti is very well represented in fact, although the greater part of what there mmust have been at one time has now been lost. 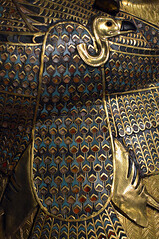 There were lots of good examples in these exhibitions: Pharaohs of the Sun (catalogue: https://goo.gl/qYJa4n), and In the Light of Amarna (https://goo.gl/rMvX6Y). Hi Chris. My name is Mike. I wanted to know what the Egyptians believed in tems of origins. Did they beliee in evolution? Hi Mike, there were numerous beliefs among the Egyptians as to how man had come into being which we call creation myths. This page provides a good starting point for further reading: https://en.wikipedia.org/wiki/Ancient_Egyptian_creation_myths Enjoy! all of them have probably asked the question on tut’s basic life and death..i wanted to ask whether you believe in the curse given to the tomb….that of whosoever opens it…death will come to him/her…. also are you planning to come to india…..i would request you to..please come here and unsolved the mysteries of the vast history of here’s culture……everyone is anxious to get them unsolved..and i find only you to open it..
Hi, Chris. Are there any recent books or articles on the current theories regarding King Tut and Nefertiti (like the potential for a hidden burial chamber) that you recommend? dear chris if Nefertiti was the mother of Tutankhamon, why would he have a wet nurse, foster mother from such an early age? Akhenaten had a sister Sitamun could she be his mother instead,just a thought anyway really enjoy your programmes, best wishes sue. Thanks for the amazing work you do. i see documentary that you have been envolved. I love egyptians history and you give a lot of good knowledge in that programs, it feels wonderfull to see how a young man like you can bring more and more passion in that ancient history. greetings from zurich (ch). Thank you Sandro, I really appreciate your kind comments 🙂 Best wishes for 2017! j’ai vu le filme documentaire de Toutankhamon; et vraiment c’est un chef-d’oeuvre.bonne continuation. je voudrais seulement savoir pour réussir dans l’archéologie ,et participer à des fouilles dans le monde et réaliser mes rêves d’être une archéologue qui aide les autres archéologues pour réaliser leurs rêves, comment je peux faire? Dear Souhila, it is not easy to get involved in archaeological projects and usually one has simply to write to a lot of letters / e-mails to project directors asking if they have any places available (this is how I did when I was a student!). You should try to think about the skills that you have and why you might be useful to a project director – making sure your CV is in good shape is a good idea! In the UK the Council for British Archaeology offers advice on how to get involved: http://new.archaeologyuk.org/cba-volunteering/ I suggest you look for similar organisations in other countries in which you would like to work to see what’s available. Good luck! merci beaucoup pou vos conseils ils m’ont remonter le morales, je vais faire ça, terminer inchalah ce que j’ai dans les mains(le sujets de ma recherche ) pour que je puisse être libre pour démarrer en bonne voie. inchalah je vais être à la hauteur et réaliser mes butes.merci beaucoup et bonne continuation. Do you know when is your book about “missing tombs” will be coming out? Hi Scott, we’re looking a Spring 2018 I gather. For now, I’m still writing! Leaving aside Manetho’s history of Egypt which was probably written to satisfy Greek curiosity of the time, were the ancient Egyptians interested in recording their history? Apart from the king lists that existed, correct me if I am wrong, but it would appear an Egyptian Pharaoh in the New Kingdom knew little about his Old Kingdom counterparts. For example Thutmose’s IV Stele found at the foot of the Sphinx indicates that he was probably unaware of the identity of the Pharaoh represented by the Sphinx. In the late period Herodotus had to invent a story about the Pharaohs who built the pyramids at Giza, as it appears the Egyptians no longer knew their identities. I think the kinglists show clearly that the Egyptians were very aware of their own history. The relative accuracy of the 19th dynasty lists e.g. at Abydos is quite staggering when you consider how far distant in time the earliest kings were already by that point (almost 2,000 years!). Manetho and Herodotus would also have drawn on Egyptian sources – neither is as accurate as we might like them to have been but much of what they recorded had at least some basis in reality. Consider how much, in 2017, our records tell us of what was going on in our own countries 2,000+ years ago – the Egyptians’ records compare very well! Of course much detail will have been lost, but an incredible amount was retained. It was also commonplace for pharaohs to make reference to their ancestors and their achievements, and many were celebrated long after their own lifetimes. The phenomenon of archaising also shows that craftsmen e.g. in the Late Period must have been aware of, and indeed probably studied, much older monuments. So, were the Egyptians’ interested in recording their history – yes, I think they were, very much so! Thank you for your detailed response Chris. On a different subject I recently saw “Egyptian Vice”. I thoroughly enjoyed it despite the fact it seemed a bit over the top and had a sensationalist element about ti. Poor King Djer being singled out for all intents and purposes as a mass murderer of his subordinates when human sacrifice was a common activity with other 1st dynasty pharaohs seemed decidedly “unfair”, as were the specific characterizations made of other pharaohs in the program. Were these characterizations based on evidence or largely hyperbole? Could one really claim that Amenhotep II was a pure psychopath or Ramesses III a deviant? Just viewed a show on the Smithsonian network regarding the Tomb Of Tutankhamun, in which you were extensively interviewed. I have personally viewed Nefertiti’s Bust in Berlin, which peaked my interest in that particular episode. Very good show and now I’m very interested in reading your book. I look forward to it’s release. Where might I educate myself further on the progress of research of the tomb? And do you ever speak in the United Stares? Dear Marc, thank you for your kind words! There is no single definitive source of news about the latest research in KV 62 but Al-Ahram (here) and Luxor Times (here) are both good sources of news on archaeology in Egypt generally. I have spoken in the US in the past; I have no plans to do so at present but if/when that changes I’ll post the details here and on social networks etc. Please come to the US and speak. I’ve seen a few of your programs, and I’m hooked. I’m especially interested in information on Hatshepsut. Exactly who’s tombs are ‘missing’ in your new book? 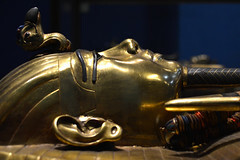 Well, I don’t want to give the entire story away until the book is published but a couple of films I have been involved in including ‘Cleopatra’s Lost Tomb’ (http://www.channel4.com/programmes/cleopatras-lost-tomb), and ‘King Tut’s Tomb: the hidden chamber’ (https://www.youtube.com/watch?v=qbA9589FTvc&list=PLTfrAEfzmXU-E4Ex6fS1QWFfswcntLHZi&index=7) might give you a few clues… I’ll also be speaking about various of the tombs involved in Chesterfield (17 June 2017), Lincoln (6 Jan 2018), Sutton (13 Jan), Sussex (21 July) and Taunton (10 November) should it be of interest! Thanks for your reply. I did watch all of the links you supplied and found out that we both went to the same university: Birmingham. I did theology. How useful have ancient languages been to you in your career? I didn’t choose the ancient languages back then because I was rubbish at Greek and had no school background in it. Yet, I have since seen a play which threw me back to the possibility of studying biblical Hebrew, then found myself a tutor and completed Weingreen’s grammar with him, plus the creation texts from Genesis. I cannot describe to you the sense of achievement I feel. We then began ancient myths and religions in English such as Gilgamesh and Enuma Elish and now I’ve been accepted to at SOAS to study Akkadian. My tutor has accompanied me to Egypt twice in the last year to the valley of the kings and Saqqara, the pyramids at Giza and there are hieroglyphs on everything that the Egyptian guide can decipher.. I was amazed. I watch so many of the programs on Egypt that I think I am confused. Currently, what is the thought on Tut’s mother? I watched a program that you were in where someone believes Nefertiti was his father’s cousin and Tut’s mother. Just curious about the latest vs common belief. Hi David, there is no clear answer to this at present and you will find lots of different theories circulating in print and on TV. I have written something on the subject for my ‘Missing Tombs’ but it’s embargoed until the book is out (sometime in 2018)! Are we any closer to finding the tomb of Cleopatra? As far as I know no new evidence has come to light recently. In fact that suits me as I’m about to submit the manuscript for a book which includes a discussion of the possible location of the tomb and I’d prefer there not to be any more movement before the book comes out!! I really enjoyed Ultimate TUT on PBS best episode I’ve seen. Thanks, I can’t stop watching it!! We saw yesterday your documentary about the treasures of Tutankhamun. In the different discussions above, you speak of 3 parts for this presentation, except us (in France) had only 2. Is a third part planned in France? Thank you for your reply. Dear Camille, three episodes were made for the US, UK and Australia but I think the series may have been edited down to two episodes for France 5. If there is another one to come I will let you know but I think you have already seen everything! I’m watching Tut’s treasures on Nat Geo the show is amazing such insight ! You are my hero I can’t wait to see and read your published articles. At what age did you sort of get an itch for Egypt? How long did it take for all your extensive schooling and such. I am asking because I have always wanted to become an Egyptologists in one form or another. Now as a young divorced mother , I feel like I can do anything, be anywhere. And tips you could give me. Hi Terrie, I can’t put my finger on the exact moment that I became interested but I was certainly very keen on the 1992 TV series, The Face of Tutankhamun presented by Christopher Frayling. I would have been 13 or 14 at that time. I was interested in plenty of other things at the time but went to university to study Ancient history and Archaeology straight after school and there, after a year or so, I decided to focus on Egyptology. I did a Master’s after my first degree, then later a PhD while I was working for the Egypt Exploration Society. One never really stops learning – these days I’m finding out new (to me) things while writing books and helping to make films for TV – and I’ve always expected that at some point my luck will run out and I’ll have to go and get a proper job but I’ve managed to survive so far (20 ish years). There’s no standard route into finding a job in the subject but you can probably expect to need at last a PhD to give yourself a good chance of making a living from the subject, and that means probably a minimum of 7-8 ish years’ study. You have to be pretty determined, and also to understand that even then there are no guarantees that you’ll find work – I’ve been very lucky. I think the best way to approach it is one step at a time – register for a certificate course or a degree and always make sure you’re doing it because you enjoy it – if that stops at any point (and some of us do start to wonder when, for example, drawing pot sherds or trying to figure out if the hieroglyphs should be read as a perfective or relative form…) then ask yourself if there might be something else you’d rather do! Good luck! I love Egypt very much and have been lucky enough to visit on a few occasions. I am particularly interested in Belzoni and Howard Carter. I have a lot of books about Carter and enjoy looking at the Tutankhamun photographs and reading the journals and diaries on the website of the Griffith Institute. I’ve since found out that the collection has been broken up and sold at various auctions and on ebay. This really upset me as I think it should have been kept together. The story of the discovery of Tutankhamun is fascinating in itself, yet the letters of the man who found it also help us to learn about the small realities of life at that time. These papers and journals would have made a wonderful contribution to the other items already in the care of the Griffith Institute. I started a Justgiving page to try and raise money to enable me to search the auctions and buy back as much of Carter’s papers as I could and donate it to the Griffith Institute. I admit it’s an uphill struggle but I am determined to try. Just watched the episode for the great fine of Psamtik I. Fascinating to watch and must have been a super find for you to witness. Thanks Ed, really glad you enjoyed it! It was fun to make and yes, amazing to see the statue fragments. Wonderful news too: I gather the excavators have now found fragments of the – very beautiful – face… I’ll try to post an image if I can! Hey Chris. I have been a resident in El Luxor and worked for the EDC in Port Said, Alexandria. Over the year the bedouins have me the name, Karam El Sayedey owing to my love of Alah, Almighty God and Isa and Miriam. I am a Carmelite Brother secular the RC order which kept peace with Saladin and Albert of Jerusalem. I studied the works if the great Egyptologust and author Christian Jacq and understand his passion and vision in the endeavour if Zahee Hawass and proofs ge he finds in Jacq research. Especially if the hidden God you cannot see and Hawass hidden chambers. I have read some if your words and documentaries and can see your very own passion in your adaptation for the general public to witness. I often am in El Luxor and sail on the Nile in my Garabia usually every three months and have made friends at the Achti Resort Hotel previously Sheraton Luxor and I am a member of the British Museum. My hobby mostly takes me through the 18,19 Dynasty but gave studied old kingdom tombs showing the famine of the old kingdom. My interest shows me a clear vision of all religions belonging to the new kingdom and its progression into the three religions with origins in Abraham and Moses. I started my research hobby over 30 years ago which has provided me with a huge enduring depth of the two Lands of Kemet, the lives and humanity if the great Egyptians. I am fascinated by the ancient Egyptians and everything that they achieved. I have watched many documentaries on ancient Egypt (including your recent excellent documentary on Psamtek I and the re-assessment of the power of the Saiti dynasty) and my wife and I were lucky enough to visit the Valley of the Kings some years ago and see the beautiful decorations in some of the tombs there. One question always puzzles me – what light sources did the Egyptians use in the underground tombs when decorating them? As I understand it, there is no evidence of wax or soot on the walls or the floors of the tombs, and therefore it seems unlikely that they used candles. So how did they see in the underground tombs? Do archaeologists know? Many thanks! Dear Dr. Naunton, do you know if, where or when the next Mummy Congress will take place? I am fascinated by all things Ancient Egyptian. Check out my own fictional contribution: ‘SCARAB’ online. Looking forward to adding your books to my collection. Your programs are always very informative and interesting. I’m sorry, I don’t know when the next mummy congress will take place or if there will even be one. My best suggestion would be to eep an eye on social media or the Egyptologists’ Electronic Forum (EEF): http://www.egyptologyforum.org/EEFNEWS.html Thank you for your kind comments about my book and TV work! I have been thinking after seeing that you have been re-enacting some of Petrie’s poses for camera: surely the above photo cannot but indicate you to be Petrie in a previous transmigration? Well, you never know! In things Egyptian, stranger things have happened: two men were talking on the bus opposite me one day (in London in the days of the bendy buses) and I thought to myself, that man looks EXACTLY like one of those extraordinarily lifelike coffin faces from Roman Egypt. And it turned out, when I listened, he was speaking Arabic. I said to him, “You’re not from Egypt, are you?” and he said, “Yes, from Gezira”. After some deliberation, I finally couldn’t bring myself to explain to him the connection. I’ll leave that to him to find out for himself when he ‘comes forth into the Light’. & my knowledge, I now realise, is insufficient on this point: unlike in Orthodox Judaism and in early Christianity, did the Ancient Eqyptians believe in the transmigration of the Soul? Hi John, Although the Egyptians had quite a well-developed idea of what we call the ‘soul’ and had their own words for it – the ‘ka’, ‘ba’ and ‘akh’ are all thought to represent the spirit or soul of the deceased individual – they had no belief in the possibility that the soul could be manifested again in a different individual as far as I know. Thanks for your question!